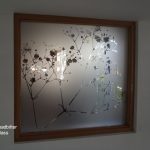 In simple terms a glass sealed unit is two or more pieces of glass glued together with a gap in between to help create an insulating barrier to the outside weather. 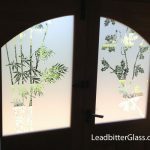 There are many different types and ratings of glass sealed units available from Leadbitter Glass such as energy saving units, toughened glass and laminated glass units. This section will help you understand the basics of sealed unit construction. 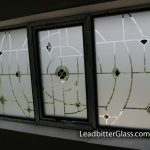 Leadbitter Glass uses 4mm toughened safety glass as standard in all orders unless a different type of glass is requested. 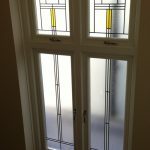 A standard double glazed sealed unit is created by placing two pieces of glass together with a Spacer bar in between the glass. 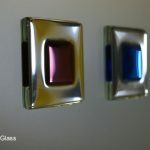 Common sense will tell you that the further away these two pieces of glass are from each other, the warmer the internal piece of glass will be because the cold diminishes as it conducts across a wider spacer bar. 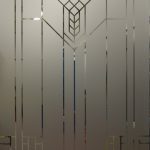 Spacer bar sizes range from 6mm to 20mm so when added to two pieces of 4mm thick glass, this gives a minimum double glazed sealed unit thickness of 14mm and a maximum thickness of 28mm. 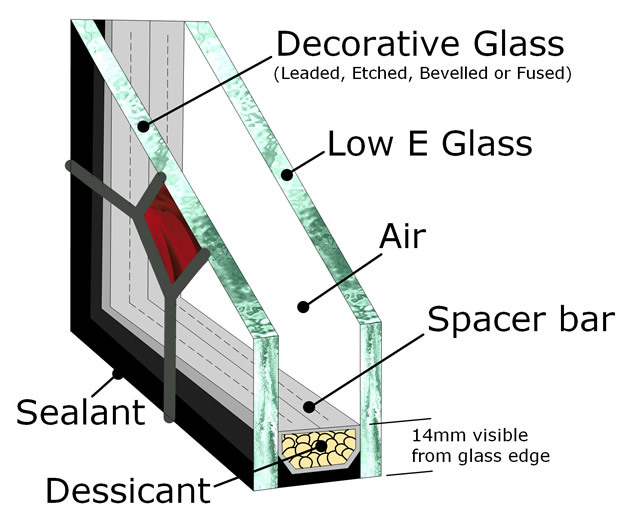 Inside of the spacer bar are placed small absorbing Dessicant beads that help rid the sealed unit of any moisture if any moisture should enter the glazed unit. 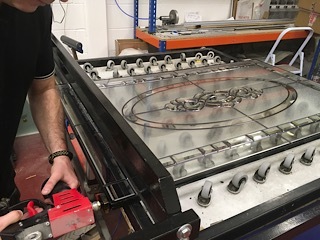 A black hot melt glue Sealant is then applied to the outside edge of the glass (see top image) to bond the 2 pieces of glass together and also to keep the spacer bar in place. 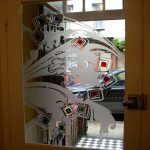 We can create thicker sealed units if required by using thicker glass such as 6mm glass for example. 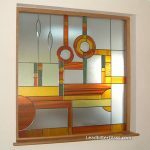 PLEASE NOTE: Spacer bar will be visible at around 14mm from the glass edge so this must be taken into account when ordering your glass. Make sure your beading is high enough to cover this or order a specific colour of spacer bar to make it less noticeable if your beading is shorter. 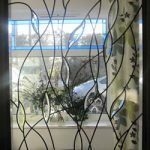 Only a small percentage of customers actually order triple glazed units with us but they may still be the right choice for you. 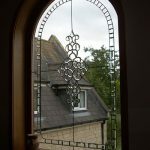 Triple glazed units have a better energy saving rating than double glazed units because there are now 3 pieces of glass for the cold to travel through before it gets into your home. 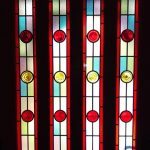 Triple glazed units are almost 50% heavier in weight than a double glazed unit so this needs to be taken into consideration when ordering large windows.